Install all corner posts and end posts (see corner and end instructions). 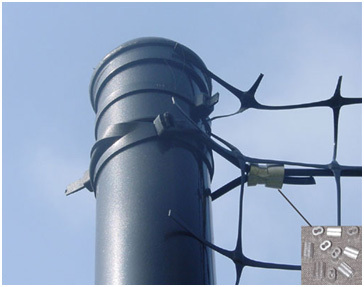 If installing Access Gates or Drive Way Gates, install the supporting ends of the gates, as well. Installing monofilament wire provides a guideline for installing you fence posts in a straight line. This also keeps your deer fence from sagging between posts. Step 1: Begin by feeding the end of the monofilament line through one side of the connection sleeve. Wrap the monofilament around the end or corner post near the ground. Then thread the end into the other side of the connection sleeve. Push the sleeve so that is as close to the post as possible and as close to the bottom of the post as possible. Then, using the crimping tool, crimp the sleeve so that the monofilament wire is secure. Line the connection sleeve up with the appropriate notch on the crimper and close the handles. Trim any access wire. Step 2: Criss-cross two self locking ties, forming an “X” around the post and over the monofilament wire to further secure the wire in place. Use a tie puller and cutter tool to tighten the ties and trim the excess plastic. Unroll the monofilament wire to the other corner or end post and repeat process. Step 3: You want your monofilament wire taut. Deerbusters recommends using a round monofilament tightener. Place the wire in the center of the tightener, insert the tightening tool in the large hole on the monofilament tightener and turn clockwise to tighten the wire until it is taut. The metal piece with the tightener is meant to keep the monofilament wire from unraveling. 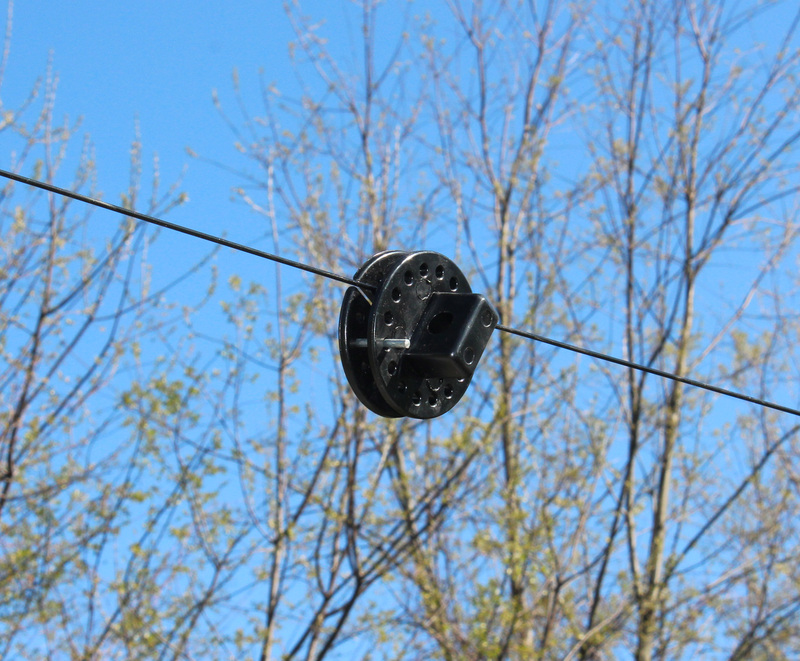 Place the metal piece in the holes right below the wire on one side and right above the wire on the other, making sure the piece goes through the wholes on both sides of the tightener to secure. Round monofilament tighteners should be placed on each stand of monofilament tension wire per side. 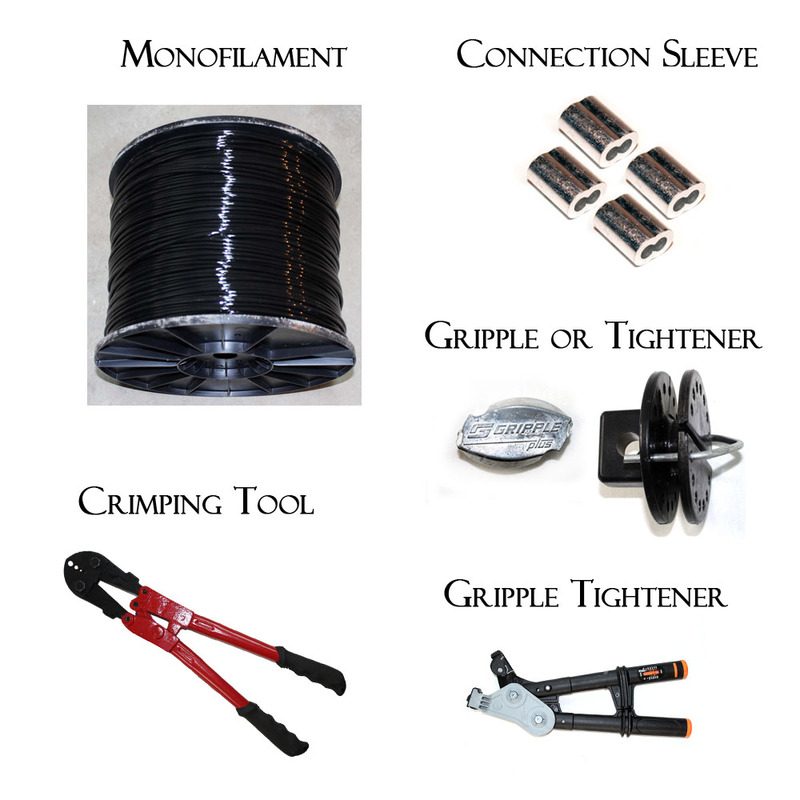 Use gripples to connect two broken or cut ends of monofilament. *You will want to repeat this process at the top of each post making sure the monofilament wire is as close to the top of the post as possible.